What conditions does Rotarix treat? Tell the health care professional right away if any of these serious side effects occur: persistent/high fever greater than 102 degrees F (39 degrees C). A very serious allergic reaction to this vaccine is rare. However, get medical help right away if you notice any symptoms of a serious allergic reaction, including: rash, itching/swelling (especially of the face/tongue/throat), severe dizziness, trouble breathing. List Rotarix side effects by likelihood and severity. Before using this vaccine, tell your health care professional your child's medical history, especially of: current fever/illness, current vomiting/diarrhea, stomach/intestinal problems (such as blockage, intussusception), not gaining weight/growing as expected, blood cancer (such as leukemia, lymphoma), blood disorders (such as hemophilia), immune system problems (such as HIV/AIDS, SCID). What should I know regarding pregnancy, nursing and administering Rotarix to children or the elderly? Some products that may interact with this vaccine include: corticosteroids taken by mouth or given by injection (such as dexamethasone), drugs that weaken the immune system (such as azathioprine, cyclosporine, cancer chemotherapy), recent blood transfusion. 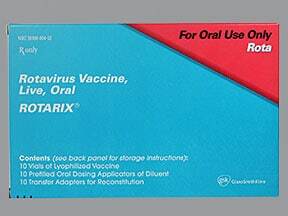 Does Rotarix interact with other medications? Are you considering switching to Rotarix? How long have you been taking Rotarix?